Dan Corn – The Peak, Inc.
Dan Corn started guiding in 2004 and has worked in the United States, European Alps, Chilean Andes and the Himalaya. 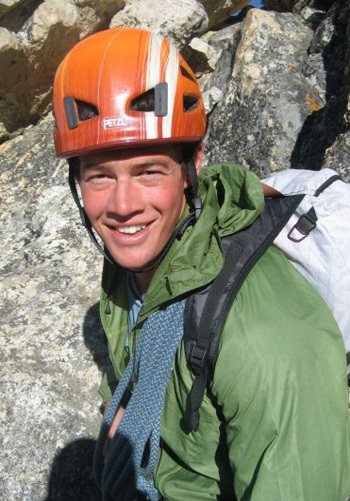 He currently works for the Peak and Exum Mountain Guides in the Tetons as well as the American Avalanche Institute in the northern Rockies. In the springs months, Dan works as a climbing/mountaineering ranger in Denali National Park on the highest peak in North America. Dan is an IFMGA certified mountain guide, has a Level 3 Avalanche certification, a WFR/CPR certification, LNT trainer, an instructor for Rigging for Rescue and has a BS degree in Adventure Education. Dan’s impressive resume includes working for White Mountain National Forest as a backcountry ranger, the International Mountain Climbing School as a rock/ice/ski guide, a lead guide for Exum Mountain Guides, The Peak as a military instructor for climbing/backcountry ski guide, an avalanche forecaster at the Mount Washington Avalanche Center, a climbing/rescue ranger for Denali National Park and a Heli-ski guide for Valdez Heli Ski Guides, Irwin Guides, PowderSouth and Tordrillo North. Dan’s skills include: rock climbing to 5.12c, ice climbs to W16, Alpine climbs up to V5.12 and skiing experience around the world. GSA Schedule MOBIS 874-4 Instructor Led Training and Education Courses, Course Development and Test Administration. The Peak Inc. © 2017 All Rights Reserved.